With a retro loungy profile, the Divani Casa Corsair Modern Grey Fabric Sofa emanates a cool breezy style design. 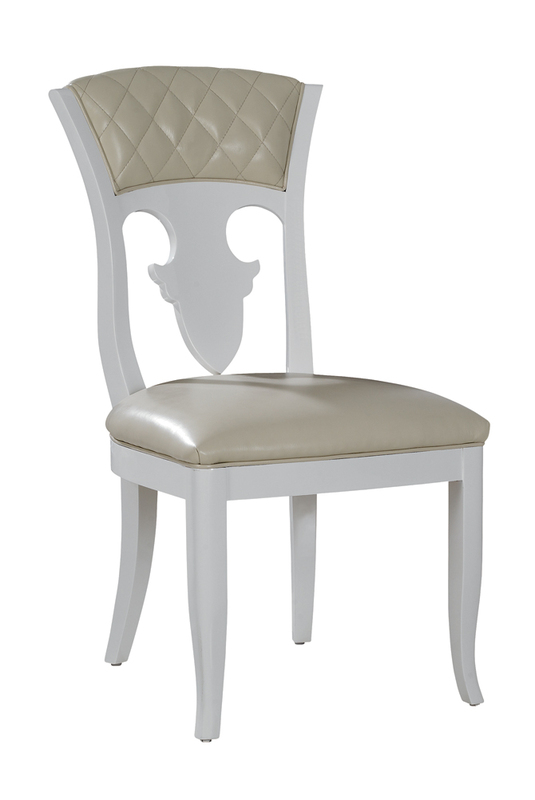 Adding to its nostalgic charm are the square-shaped arms and distinctive vertical and horizontal equidistant tufted stitching on the back. 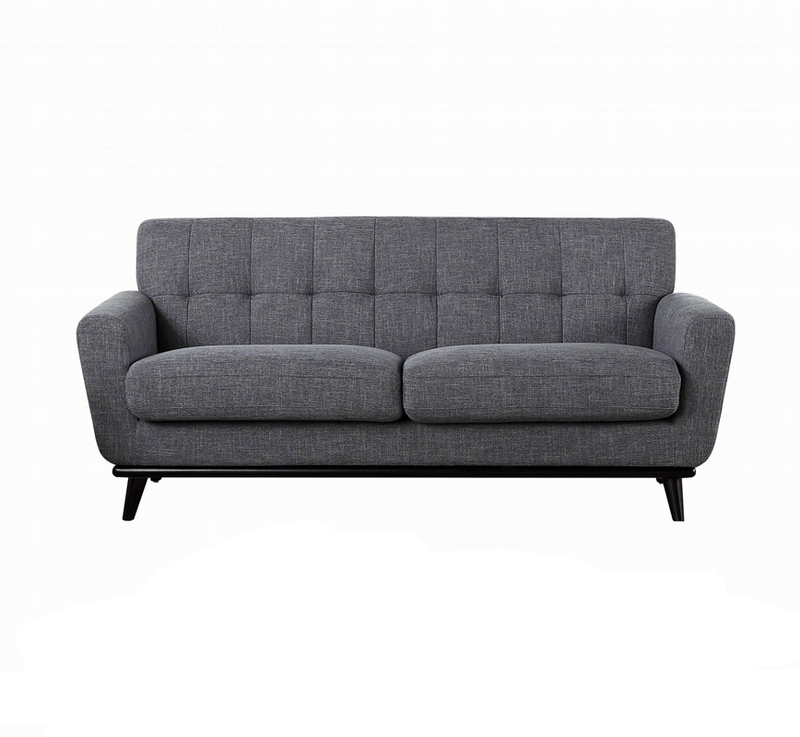 Upholstered in trendy soft to the hand grey fabric, this casually unfussy styled couch comes with removable thick cushioned seats making it ideal for enjoying downtime with the family or with friends. Durably constructed to last, the Divani Casa Corsair fabric sofa will give your living room a smart makeover! 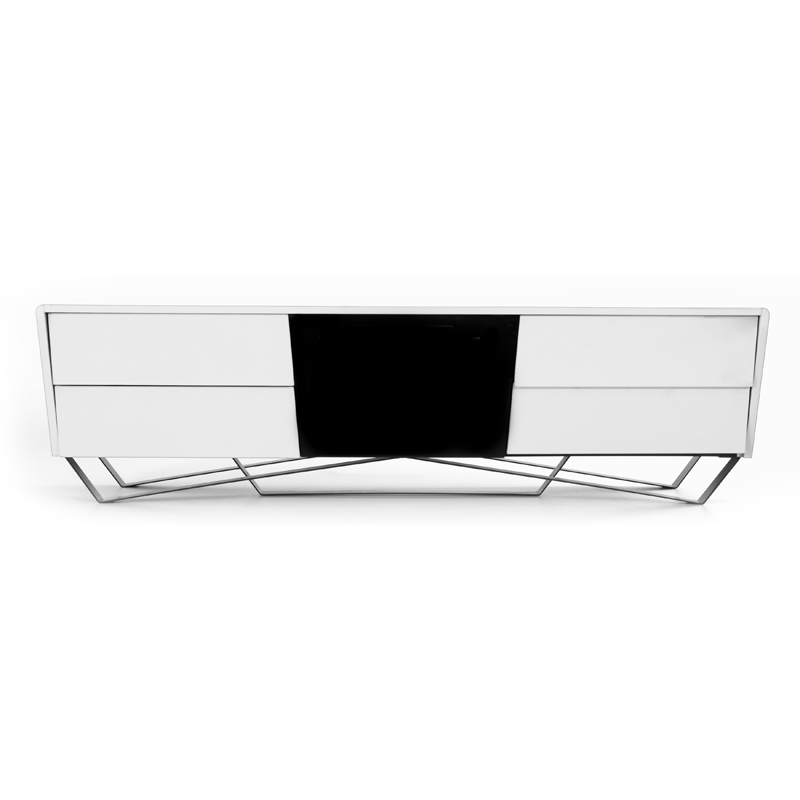 The TV098 modern white glossy TV stand presents rounded ends, with the right facing section featuring a glass shelf, and a mirrored black piece top on the left facing section. It features 2 conveniently designed pull down doors with an airlift mechanism. The left facing door has two shelves that extend to the left rounded end. Electrical wire holes keep your cables organized. 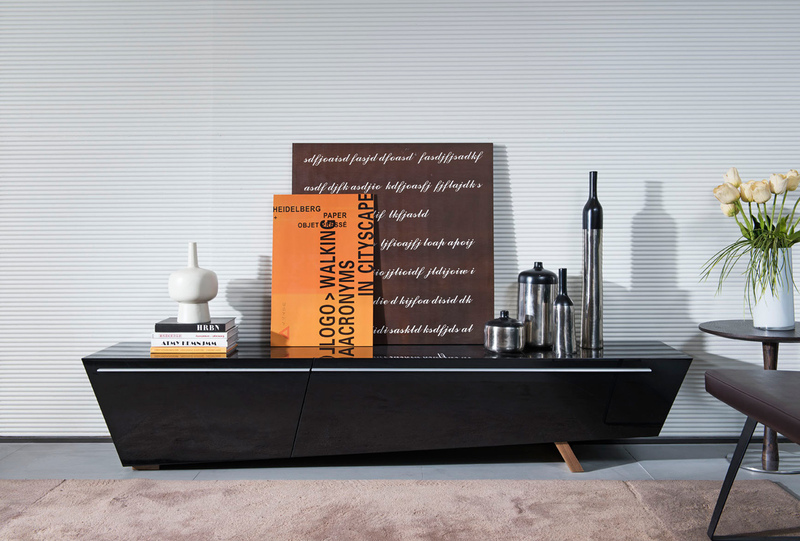 The TV097 modern glossy grey TV unit showcases curvy lines on the black accentuation featuring a pull out drawer in the center offering you much functionality. Simple and elegant, it unit measures W75 x D16 x H18, offering your living room a stylish touch with is strong and sturdy construction. This entertainment center unit combines modern edge with retro flare. It has easy access to all of your A/V components and is made in white glossy lacquer and oak wood veneer finish. It also features a built-in light for an ambient contemporary glow. This elegant style black tv stand comes with a strong and sturdy construction, it has excellent craftsmanship, and it is uniquely designed to compliment your decorative collection. 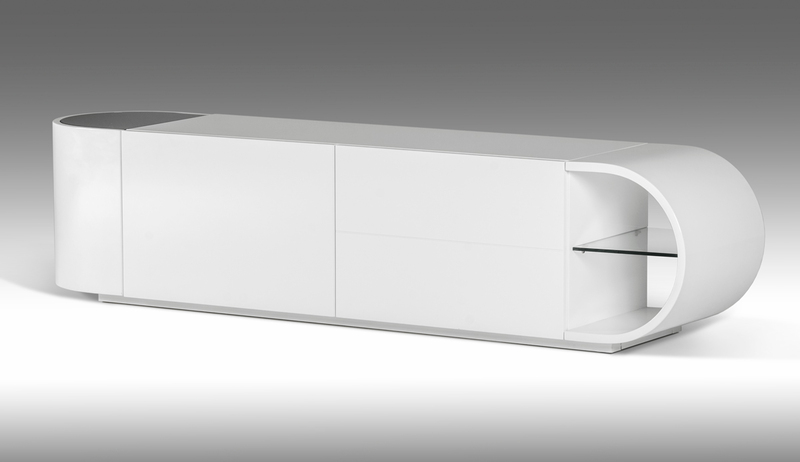 The Modrest TV068 modern white TV stand offers an interesting overlapping design featuring 3 drawers and an open shelf for adequate storage space. This very handy and practical TV stand has a sleek full white gloss lacquer finish. The inside and backboard of the drawers is made of stunning natural oak melamine. Electrical holes at the back keeps cables organized. 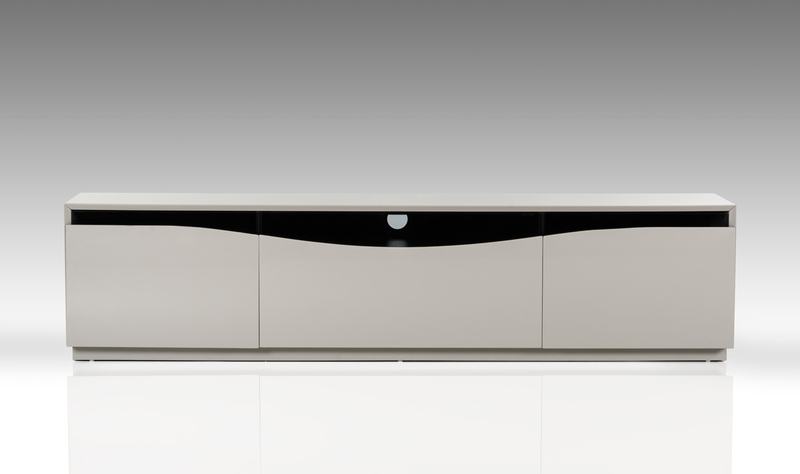 The TV048 modern glossy grey TV unit showcases a distinctive design featuring angular lines on all sides. It includes 2 pull out drawers that is of different sizes, to conceal media devices. The drawer pulls are in white slim lacquer. It is supported by brown oak leg. 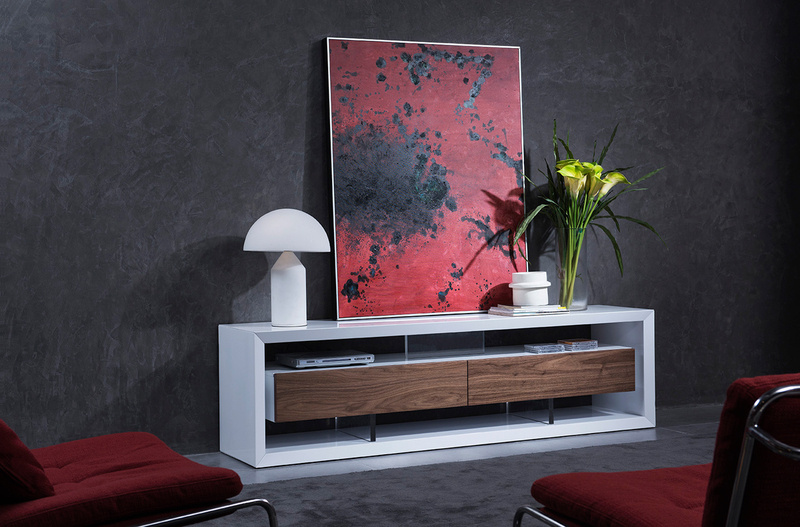 Combining the materials MDF and melamine, this TV unit renders an exemplary touch to your home. The Modrest Keene Modern White & Black Oak TV Stand features a superb functional design in white high gloss finish and a black Oak veneer center top. It features a single pull-out drawer fitted with 3 compartments and a shelf. The middle upper section of the pull-out drawer front features a smoked blue-grey tempered glass, making this TV stand remote-friendly. It is equipped with a single wire hole for cable organization. This stylish modern TV stand does not require assembly and has a dimension of W71 x D18 x H17. 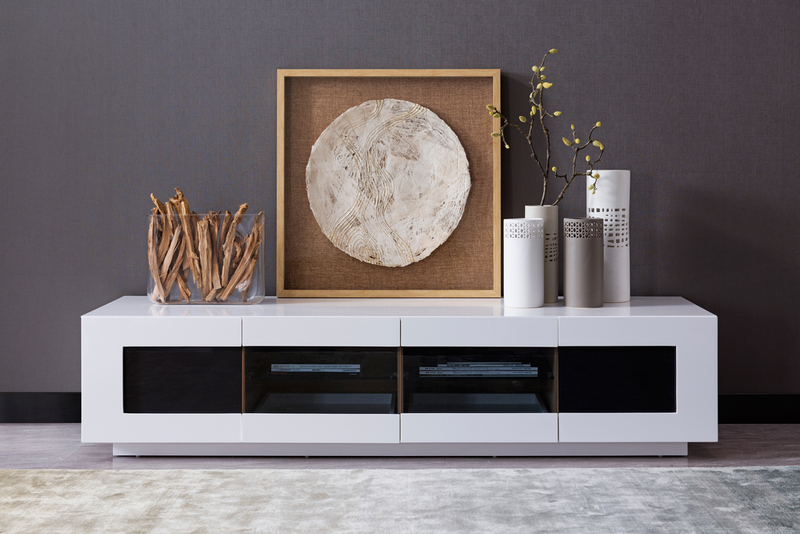 The Modrest Frost Modern Small White TV Unit features a magnetic versatile design in dainty white high gloss finish. It is fitted with 2-level interior glass shelves and 2 pull down doors with remote friendly tempered purple painted glass on the middle section. Featured on both ends are 2 pull out drawers with blue remote friendly tempered glass. All inside drawers are in fine natural Oak backboard. To prevent wire clutter, it features 2 electrical wire holes. Requiring no assembly, this functional modern TV unit has a dimension of W79 x D23 x H18. 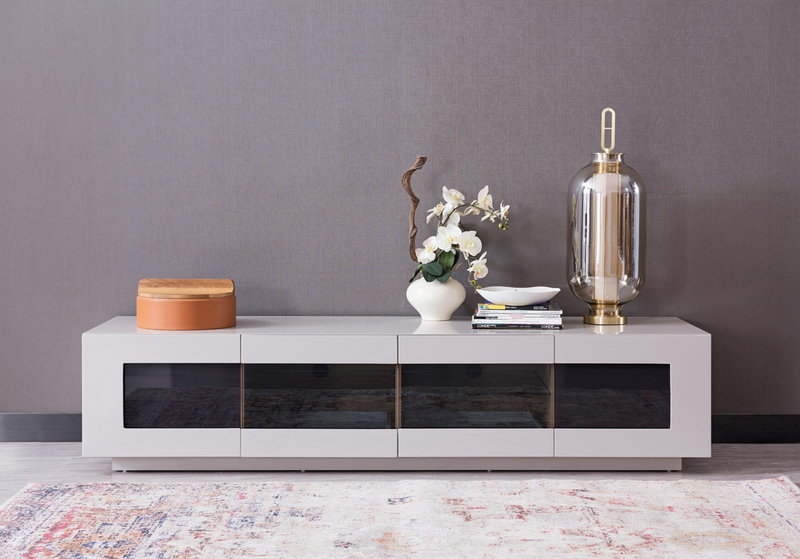 The Modrest Frost Modern Small Grey TV Unit features a useful practical design featuring a beautiful glossy grey finish. It offers adequate storage space with the 2 pull down doors with remote friendly tempered purple painted glass featuring 2-level interior glass shelves. Additionally, it is fitted with 2 pull out drawers with remote friendly blue tempered glass. All drawers feature a beautiful natural oak drawer inside and backboard. Two electrical wire holes at the back keep your wires organized. With a dimension of W79 x D23 x H18, this modern TV stand requires no assembly. The Modrest Frost Modern White TV Unit features an immaculate white high gloss finish and is fitted with two (2) interior glass shelves and two (2) pull down doors with tempered purple painted glass. It also has two (2) pull out drawers with blue tempered glass and electrical wire holes. A natural oak backboard is used for the inside drawer and the glass is remote-friendly. The Modrest Manvel Contemporary White & Walnut TV Stand evokes posh and style featuring a white gloss finished body and 2 drawers with Walnut veneer fronts. The drawers were made to look suspended with clear acrylic supports that made way for open shelves over and under the drawers. This contemporary TV stand requires no assembly. The Modrest Hurst Contemporary Grey Gloss TV Stand is a classy creation featuring a lustrous grey gloss finish and a 12-mm clear tempered glass top. Offering ample storage, it features 3 drawers with brown oak veneer shelves and open shelves under the glass top. 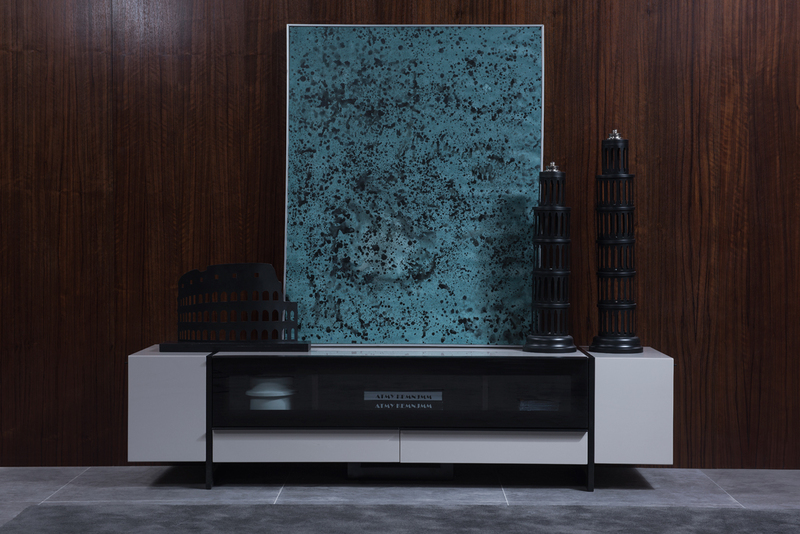 This contemporary TV stand has a dimension of W83 x D19 x H20. Functional Art! 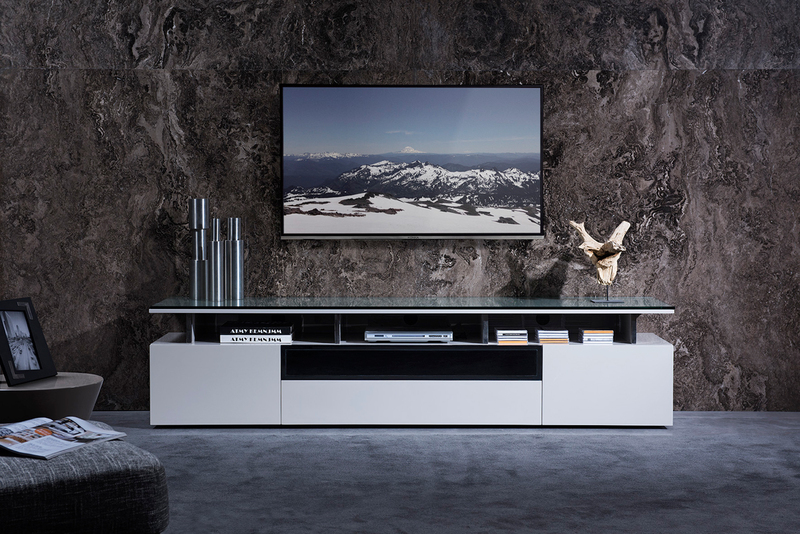 The Max Smart TV unit is an intricate piece that pushes the boundaries of design; besides the abstract shape of the metal black legs and contemporary overall look, this entertainment stand features slanted drawers with a white high gloss finish. Centered 2-level shelves with a remote control friendly smoked glass pull down door with gas lift mechanism, 4 spacious drawers to store media items and electrical wire holes to avoid entanglement. The back panel is placed with magnets so it can be detached for ease of access to cables and consoles. It will definitely give you the WOW factor you are looking for. Original design by Alan Soria. Functional Art! 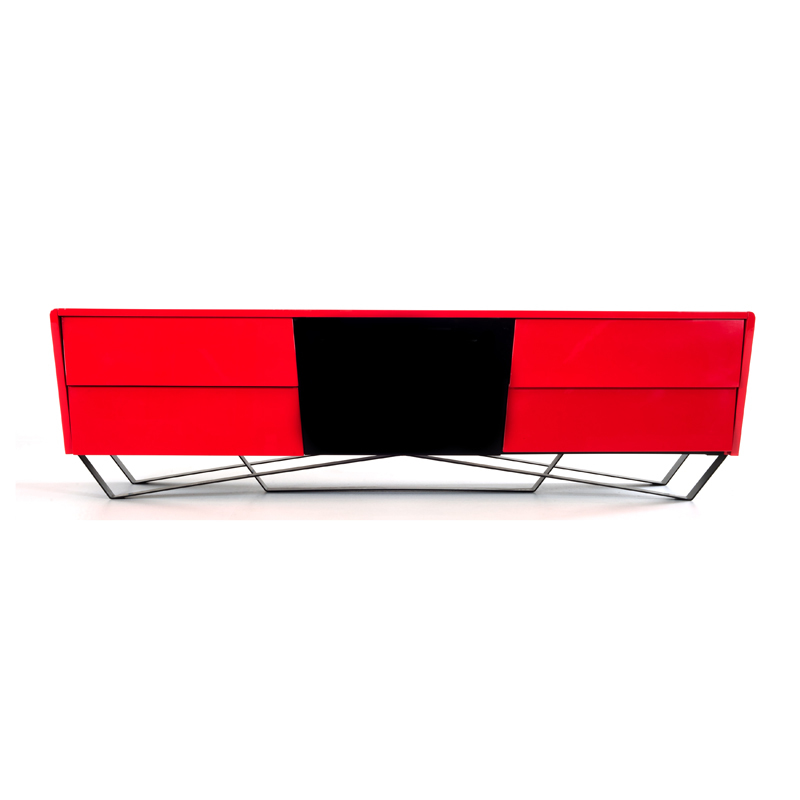 The Max Smart TV unit is an intricate piece that pushes the boundaries of design; besides the abstract shape of the metal black legs and contemporary overall look, this entertainment stand features slanted drawers with a red high gloss finish. Centered 2-level shelves with a remote control friendly smoked glass pull down door with gas lift mechanism, 4 spacious drawers to store media items and electrical wire holes to avoid entanglement. The back panel is placed with magnets so it can be detached for ease of access to cables and consoles. It will definitely give you the WOW factor you are looking for. Original design by Alan Soria.